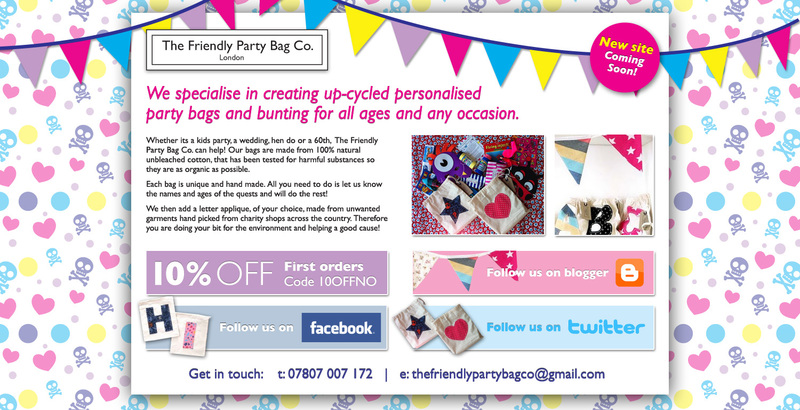 The Friendly Party Bag Co.: Exciting week working on our new landing page!!!!! Exciting week working on our new landing page!!!!! I have had the great pleasure to work with the very talented Leanne Nicholls this week, who, as I'm sure you will agree is a fantastic graphic designer. This will be our holding page when you visit www.thefriendlypartybagco.co.uk, still a few tweaks to be done (I need to pull a my finger out with a bit of photography!) but fingers crossed it will be going live soon! We are all so very excited! If you need help with making your graphics fab, contact Leanne Nicholls on leanneknicholls@gmail.com.